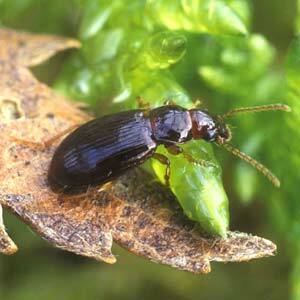 Description: A 4-4.5mm brownish-black ground beetle found under leaves and in moss in shaded places, usually old acid woods on or near peat. World Distribution: An Oceanic temperate species (71) with a very limited range comprising the British Isles, Belgium, the southern Netherlands and northern France. Irish Status: Widespread but local. Ecology: More hygrophilous than the other species of Bradycellus. A silvicolous species which is mainly recorded from woodland abutting acid heath or where drainage of lowland raised bog by agricultural improvement or turf-cutting has allowed birch seedlings to become established to form oligotrophic, acid woodland.